More and more people might think of the Military Intelligence Service, the lesser-known group of Nisei who served bravely during WWII in the Pacific, island-hopping with General Douglas MacArthur and then helped as interpreters in the US Occupation of Japan. So many of the MIS kept mum about their experience because the government demanded secrecy about their service. Today, they deserve the spotlight of history to shine brightly on their accomplishments. These men are the JAs’ “Greatest Generation,” the generation that came of age before the baby boomers, and fought for the rights that so many of us enjoy (mostly) without worry today. Their invocation is appropriate. It’s even more important to remember them and celebrate their accomplishments today, as so many are passing from our families and communities. I salute the Japanese American WWII veterans, always have. And, I also salute all the thousands of other JAs who’ve served in America’s military, both men and women, in both wartime and peace. My father was in the US Army during the Korean conflict. His journey there makes for an interesting story (and a future book-in-waiting). He was born and raised in Honolulu, but my grandfather took the entire family, including my then-8-year-old dad, to Japan in 1940. Bad timing, obviously. He and his siblings attended Japanese schools and were teased as American spies. They spoke only Japanese outside the home, and sang Glenn Miller songs inside at night. After WWII, my dad was 13 years old, and went to work for the US Occupation Forces … as a houseboy. When he was old enough, he joined the Army, worked for the CIC, the Counter Intelligence Corps, mainly interrogating returning Japanese prisoners from Siberia and identifying potential Communist sympathizers and spies. When the fighting broke out in Korea, my father was sent there. Back in Japan, he was stationed in Nemuro, Hokkaido – my mom’s hometown. They met, they married, and my two brothers and I were all born in Japan. My dad was a handsome, dashing figure in his uniform, with dimples punctuating his impish grin. We grew up around US military bases in Tokyo and later, in Iwakuni, south of Hiroshima, but we always lived off-base. That’s because after I was born, my father was told my grandfather was dying, and he came to live with us. Because my grandfather was a Japanese national, we couldn’t live on-base. My brother and I took the bus to base schools for elementary school in English, and then played with our Japanese neighborhood pals in the afternoons. My dad kept working for the Army as a civilian – he took a transfer to a Corps of Engineers job in northern Virginia in the 1960s, and we moved stateside. He remained involved with the US military through the Army Reserves, and he would fly often to Japan to Camp Zama, or to San Diego every year, for Reserves duty. Only upon his death 1992 did I find out that he had been instrumental in US-Japan negotiations with Russia over the disputed islands, and he received flowers from the Japanese government and a Legion of Merit medal from the US government at his funeral. He never talked about his military life, even though we grew up around bases and PXes for shopping, and were very familiar with the “look” of military bases everywhere, with their wide-open roads decorated with statues and military equipment like tanks and jets, tidy rows of low buildings (that all were painted institutional green inside) and barracks and schools. He never acted particularly “military” at home, except we all made our beds like they were Army cots and we always had dinner at 5:30 on the minute. He never talked about the Army. He’d get nostalgic when he hung out with his military pals and they drank beers – lots of beers. But he never told us about his childhood experience in Japan, until he was diagnosed with cancer and I asked him what it was to be at Pearl Harbor on Dec. 7, 1941. “I don’t know,” he said. “I wasn’t there.” That’s when he explained how his family had gone back to Japan the previous year. 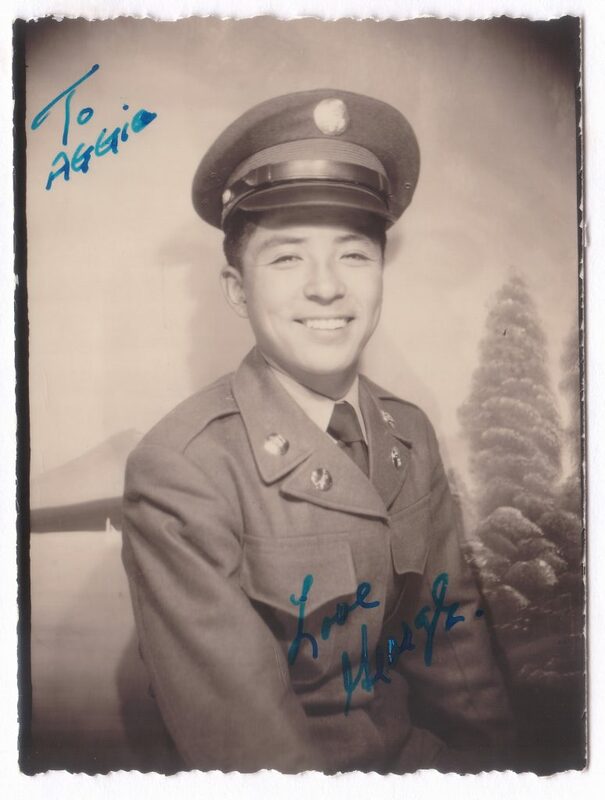 I’ve met other Japanese American veterans over the years, including many who, like my father-in-law, was stationed in Okinawa in the years before we got tangled in Vietnam. Or my wife’s uncle, who served during Vietnam while protests raged at home. I was glad that there was a Japanese American Vietnam veteran who was interviewed in some of the episodes of Ken Burns’ landmark “Vietnam War” documentary series. It shows we’ve served as patriots throughout American history. JAs – and in fact Asian Americans from across the ethnic landscape — have served in all the “modern” wars in Afghanistan, Iraq, Iran and Syria. I would lay odds that AAPIs and JAs are serving as I write this, in the secret or lesser-known battlefields of Niger and elsewhere in central Africa. So I want to pay tribute to the awesome Nisei who fought to display their valor and for our pride, and for every Japanese American who’s put on an American uniform in the decades since. We all owe you so much. Thank you, truly, for your service. NOTE: This post was originally published in Pacific Citizen, the national newspaper of the JACL, fort which I’m the editorial board chair.